Dane Laffrey’s multi-dimensional set provides perfect modern suburban setting for a civilized evening discussion and reflection between two sets of parents. The Novak’s son was involved in an altercation with the Raleigh’s son that resulted in Benjamin Novak having teeth knocked out and other various pains. Veronica Novak (Johanna Day) has invited the Raleighs over to discuss a settlement between the two parties. After some polite “chit-chat,” the flaws in each person’s facade begin to show–particularly when they try to hide them. Like a crack in stone, each character, one by one, shatters into little pieces until they are all behaving on a primal level where each person is out for blood. Johanna Day plays the overly bourgeois anthropologist Veronica who sincerely believes that “it takes a village to raise a child” and becomes incensed when the Raleighs do not want her advice or help. Day’s performance is so taut that it’s not surprising that she explodes. While being the most conciliatory character of the group, she resents that no one wants to create a constructive settlement between the two parties. She represents the modern parent in our litigious society that would sue a teacher for destroying her child’s self-esteem let alone having her child getting beaten on a playground. She has strong beliefs of proper behavior and responsibility, but neglects the fact that Henry hit Benjamin was a direct result of Benjamin’s actions and does not believe her son has done anything wrong. Stephen Bogardus plays the dutiful husband to Veronica, Michael, but it does not take long to realize that while he goes along with Veronica’s beliefs, he does not agree with them. Bogardus morphs from the calm, rational partner to the “guy’s guy” who seems to believe in the natural law of man. As a female, I could understand Veronica’s frustration; but Veronica’s uptight nature makes it seem inevitable that he would eventually rebel against her categorical morals. Christy Pusz, as Annette Raleigh, is the most self-realized of all of the characters. While she tries to be proper and accepting, she physically cannot contain her repulsion at being told how to be a parent, what her responsibility is, and the apparent isolation she feels as she gets no support from her husband. Even when she is not speaking, Pusz’s physicality speaks volumes about her frustrations. Alan (Brooks Ashmanskas) is a lawyer who is more concerned about protecting his clients than his son. Without apology, Ashmanskas lets Alan constantly remain self-absorbed and perpetually attached to his cellphone. As the show progresses, he finally admits that he believes in Darwinian law, which provides bonding between Michael–at least for a few moments. Reza’s construction is far from a simple conflict between the two sets of parents; conflicts and alliances are created and destroyed between the men and the women, the dominant and submissive partners, the emotional and the rational. Daniel Goldstein’s direction perfectly matches the twists and turns of the conflicts and utilizes all of the space, cleverly designed by Dane Laffrey, and levels with precision and distinctiveness. Furthermore, Goldstein provided an dynamic between the actors that allows the actors to fully lose control within a safely choreographed environment. Yasmina Reza’s play is biting and complex. 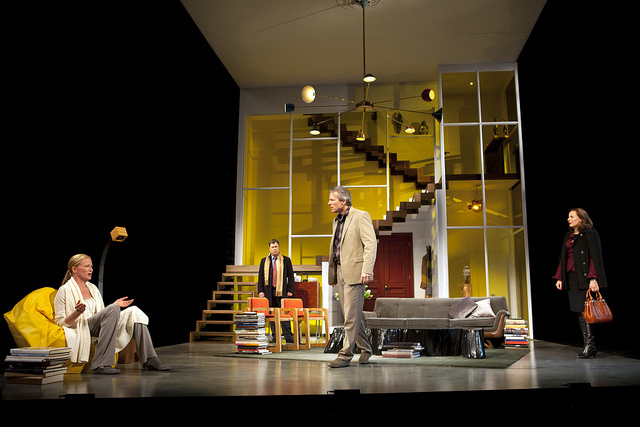 God of Carnage exposes “polite society’s” dark desires and allows the audience the opportunity to release the tension they have in their own lives. The show also emphasizes that maybe society has become too cordial and that maybe if we were more honest with each other, maybe there would be less litigation, less road rage, and less passive aggressive maneuvers within the world. The tight script combined with the masterful production at Huntington brings a fast paced, non-stop ride of laughter and pain that does not end until the lights go down. This entry was posted in Comedy and tagged 2012, agression, black comedy, Boston, Brooks Ashmanskas, bully, Christy Pusz, civilization, Comedy, Dane Laffrey, Daniel Goldstein, February, God of Carnage, human nature, Huntington Theatre, January, Johanna Day, Kids, litigation, MA, neanderthal, parents, playground, polite society, responsibility, self-control, Stephen Bogardus, Yasmina Reza by beccackidwell. Bookmark the permalink.